Hi everyone! Well you certainly made it difficult to choose a Chic of the Week this week! There were some beautiful entries and some very creative wreaths! 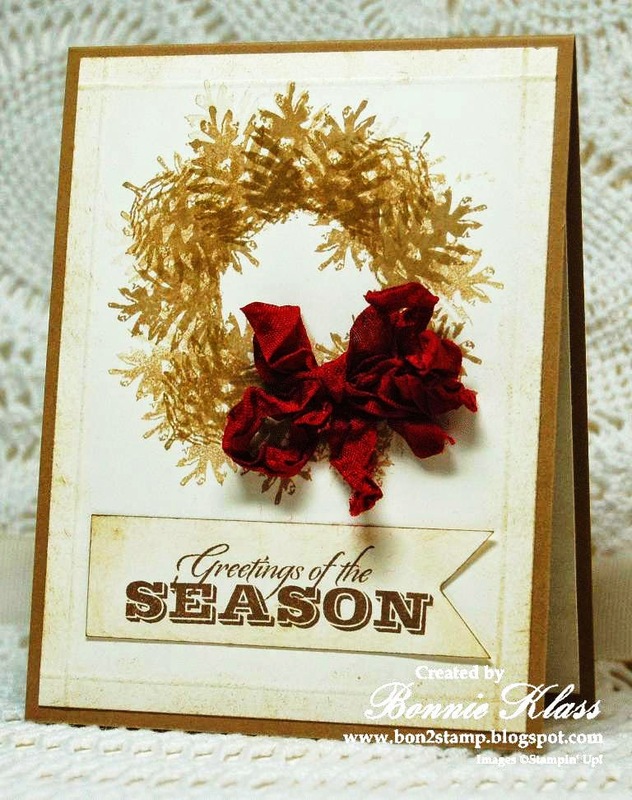 In the end, I chose this rustic card by Bonnie Klass! I thought using a pine cone image to create the wreath was very creative! Love the bow as well. Congratulations Bonne! Please contact me at lisajugs@roadrunner.com to get your Chic of the Week badge! Please join us tomorrow for our Trend Challenge. Chris has chosen a very trendy technique I know you'll love to try! See you then! Gorgeous! Love the layering of the pinecones and leaf stamps! Very inventive!